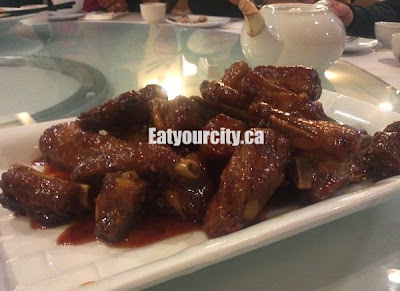 At a recent family dinner, noone in the right mind wanted to cook for that many people, so we headed down south to Beijing Beijing Dim Sum and Seafood Restaurant. Modern red, gold and black accents brighten up the large cream dining room divided in half tonight as they were hosting a 1 month babyshower/celebration on one side with the other saved for regular guests. Service is a bit harried and abrupt compared to the last few times we've come to eat, but its mainly due too few staff trying to run to the party being hosted over the partition on top of regular dining guests. This soup is a translucent chowder - thick with plenty of crunchy crisp sweet bamboo shoots contrasting nicely against little bits of crab meat, slices of Chinese mushrooms and soft chunks of tofu. Salty, savory, and satisfying bowl of soup to warm you up to your toes. Even the meat lovers enjoyed it despite all the julienned veges! Next up was one of my favourite appetisers. 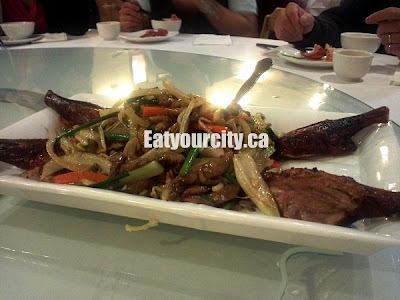 Again, as the waitstaff were a bit stretched out tonight, normally a hot Chinese style BBQ duck is wheeled out and sliced tableside. Tonight, the duck is sliced inside the kitchen. Boo. No tableservice! There were more grumbles as we had ordered a double order so everyone could have 2 servings, and only 1 serving was served. The kitchen was so swamped they didn't have time nor staff to rectify. Ah wells.. then again, the last time we had the crispy duck skin, the waiter had only carved off 1/4 of the duck skin rather than carving the whole duck. 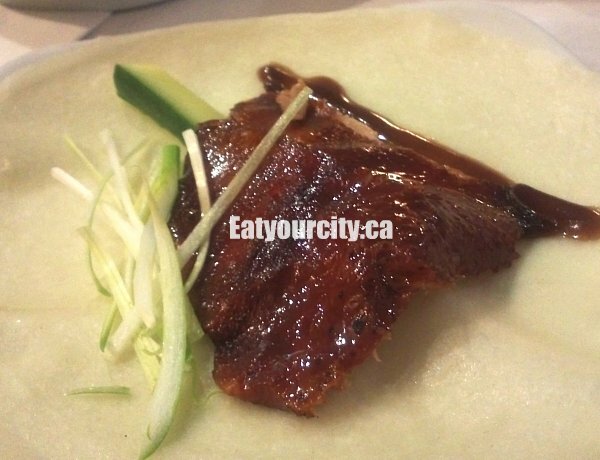 The crispy, flavorful BBQ duck skin slices are served with your choice of sweetened hoisin sauce, julienned leeks and cucumbers, all wrapped in a thin steamed rice wrapper. We were getting hungry at this point, so we all made these two fresh lobsters disappear like magic. Chopped into bite sized pieces,and stir fried to a succulent moist, each piece laced with a ginger and green onions glaze. Mmmmm! The remaining meat on the duck we previously had from the BBQ duck wraps (supposedly) is rendered into this dish of BBQ duck strips mixed with stir fried julienned carrots, celery, bean sprouts, Chinese mushrooms and green beans, with the drumsticks from the BBQ duck lopped off and placed on the edges of the dish. The deep yellow hue of the skin is normal as these chickens get more sunshine than the regular factory farmed variety. 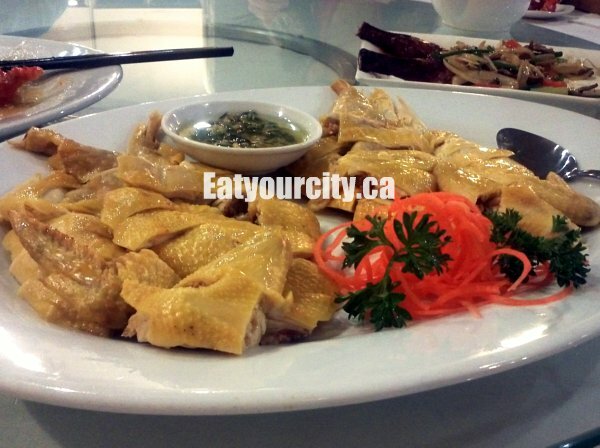 The Chicken is served with a dipping sauce of oil, salt, grated ginger and diced green onions. Improved since last time we had this dish as the chicken while on the lean side, is and moist juicy this time around. 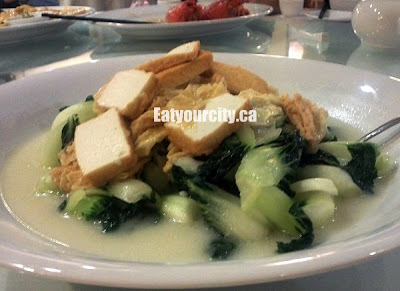 Light green baby Shanghai bok choy (regular baby bok choy lacks the green stalks), tossed together with tender bean curd sheets, and slices of fried tofu sit in a bed of savory pork based broth. 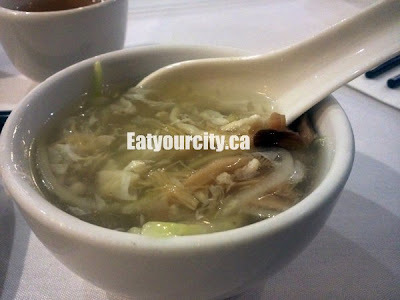 A super simple and satisfying dish as the disparate ingredients soak up and are all tied together with the salty pork bone based broth. Strawberry sauce?! Yum!!! One of our favs from our last trip here and still just as yummy. 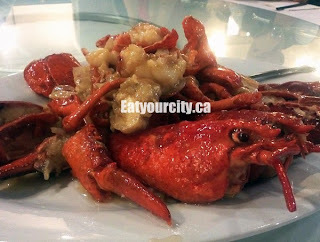 The strawberries are incorporated into the marinade and light glaze (minus the seeds - yah!) lending these spare ribs a reddish hue and light sweetness that complements the savory ribs. Though not super meaty, the sauce was a hit and my cousin made these ribs disappear like magic. 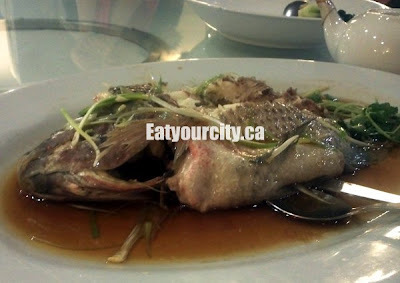 Just like last time, I wasn't speedy enough and the waiter loosened the tender fish from its bones to facilitate easier eating. The fish was fresh, and steamed to a succulent moist perfection. Served with ginger and green onions in a bed of sweetened soy sauce, each element adds a bright burst of flavor to this delicate white fish. Pretty sure it was one of the previously live tilapias they have swimming in a tank close to the kitchen. This fried rice was savory, not too greasy, and dotted with shredded dried scallop, little shrimp, tobiko and diced green onions for a bit of contrast. There wasn't as much seafood as last time, but it was a tasty rice none the less. The tobiko added in a nice pop and sweetness to the rice, however, as the hot rice cooked the raw tobiko (no change from last time), it changed the dish texturally, and not for the better. 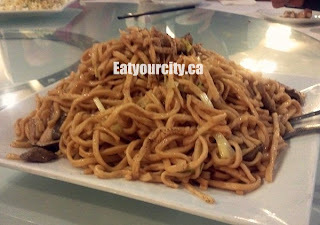 Sauteed in a salty savory mushroom and soy based sauce, these noodles that are initally fried in lard for flavor (goodbye arteries! heehee!) 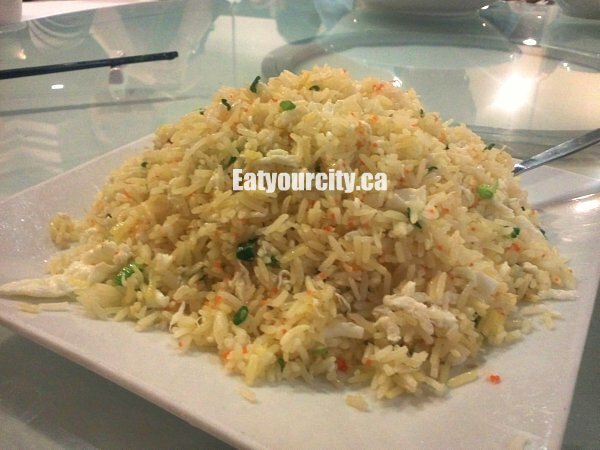 given an extra bit of richness to this dish. Nom! Ubiquitous at most Chinese restaurants, this red bean dessert was dressed up a little with a few petals of crisp slightly sweet fresh lotus bulb (the translucent white blobs) adding a nice textural contrast. Beijing Beijing Dim Sum and Seafood Restaurant is remains a decent place to have dinner, with a broader range of Chinese cuisine (both homestyle and traditional), and seafood than most other venues. Just try not to go when they're hosting an event.